Includes Airfare from Lansing, 7 night resort stay, food, drinks, entertainment and more! March 27, 2019 – 7 nights from $1,679 per person for Junior Suite. ALL-INCLUSIVE! Book your winter vacation now! This offer is good through March 26, 2019. Fill out our complimentary quote request above! Delight your palate at any of the three on-site restaurants, including seafood dishes at Blue Wave, Cultural specialties at Sur La Mer, and International cuisine at La Caracola. Sip cocktails at Blue Wave Bar or On the Rocks Bar & Lounge, or grab a freshly prepared green juice from Zumbar! When it comes to calming your mind, body, and soul, Namaste Spa & Wellness Center will pamper you in any of the five treatment cabins. Enjoy lockers, a sauna, hot tub, beauty parlor, and more while you are there, and take advantage of complimentary yoga and the on-site jogging trail as well. If your idea of relaxation includes a trip to the fitness center, you’ll enjoy that it is open 24-hours a day. Take advantage of the included equipment and break a sweat whenever you want! 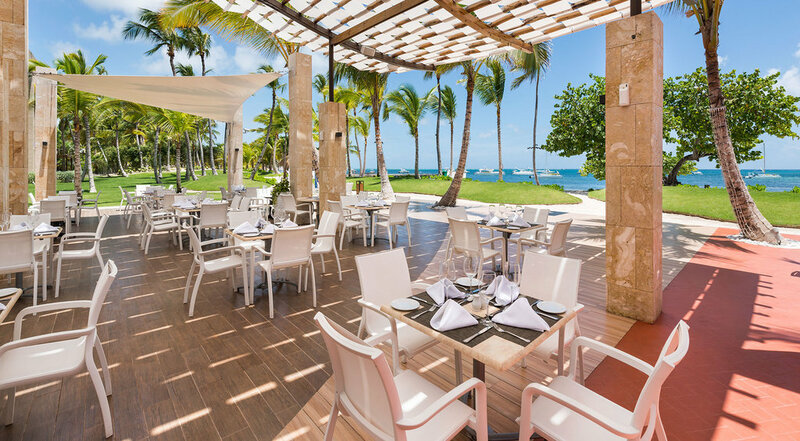 BlueBay Grand Punta Cana is located in Cabeza de Toro in the Dominican Republic. Famous for its beautiful scenery, it is a small fishing village with white sandy beaches and turquoise waters. A good choice among hotels in the Dominican Republic, as you can enjoy a family retreat by the sea thanks to an excellent selection of 156 well-equipped suites. The complex occupies nearly 400 feet of pristine white sand and features first-class amenities, well-kept gardens, two outdoor pools, a spa with multiple services, a selection of restaurants and childcare facilities. Enjoy an exquisite international buffet at Al Caracola.” where you will be able to taste and drink until your body allows it. “Blue Wave”: in this idyllic enclave you will be able to enjoy the wonderful seafood of the zone and its specialty in Caribbean food. Visit the modern restaurant “Sur le Mer” with an extensive menu made with the secrets of Mediterranean cuisine. What you always dreamed of, a bar on the beach with fabulous food to drink and continue enjoying the calm waters of the Caribbean. Relax in “Blue Wave” and give free rein to your senses. “Zumbar: Snack bar by the pool. Don’t stop dancing to the Dominican rhythm and let yourself be seduced by our extensive cocktail menu. Are you looking for the perfect place to enjoy your favorite drink accompanied by relaxing music? In “On The Rocks Bar & Lounge”, located in the lobby of the hotel you can enjoy those special moments that only you need.